The fifth and final day of the 52nd annual Hawaiian International Billfish Tournament generated plenty of fishing action, keeping judges and scorekeepers alert as 28 teams battled it out in this prestigious event. Port Vila Game Fishing Club of Vanuatu prevailed and took the HIBT Governor’s Trophy and first place. Although this HIBT rookie team did not score a fish on the final day, their lead going into Day Five was strong enough to hold off several other teams that made their move up the scoreboard. The team representing the Port Vila Game Fishing Club of Vanuatu finished the five-day tournament with an even 2,000 points. “We were following radio reports all day and keeping track of how other teams were doing,” said a very happy team of anglers. New Zealand’s Bay of Islands Swordfish Club #2 claimed second place with 1,570 points. Though the team did not score on the final day of the event, they were awarded 100 bonus points for catching the largest Pacific blue marlin of the tournament. A third team from the southern Pacific rounded out the top three positions at the HIBT. Game Fishing Club of South Australia moved into third place with 1,219 points after angler and team captain Rolf Czabayski satellite tagged and released an estimated 150-pound Pacific blue marlin on 50-pound test line in just 15 minutes. This satellite tag is now part of the Great Marlin Race, a collaboration between HIBT billfish anglers and Stanford University marine biologists to track the movement of marlin across the ocean. Marlin Parker, captain of the 54-foot Marlin Magic II, reeled in the Hawaiian International Billfish Tournament’s coveted Henry Chee Award. The Henry Chee Award was established in 1965 by the Tournament Board of Governors to recognize the charter boat captain with the highest number of billfish points scored on his boat during the five days of tournament fishing. Captain Chee was a pioneering captain and throughout his lifetime set an unprecedented number of game fish catch records that helped make his favorite fishing grounds, the Kona Coast, world famous. This is Parker’s third Henry Chee Award. Parker grew up fishing the world-famous waters off the Kona coast. His father, Capt. 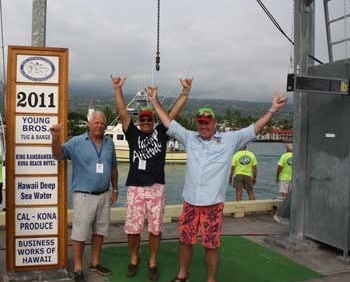 George Parker, is credited for his visionary commitment to building Kona’s sportfishing fame and was inducted into the International Game Fish Association’s Hall of Fame in 2007. Great fishing was Marlin Parker’s destiny. Marlin grew up with the HIBT and has been one of its strongest supporters. He is a seven-time recipient of HIBT’s prestigious Richard Boone Award and now a three-time winner of the Henry Chee Award. Next year’s 53rd Hawaiian International Billfish Tournament is scheduled for August 12-18, including five days of tournament fishing. Anglers and teams are invited to apply early as full tournament participation is anticipated. Log onto www.hibtfishing.com for details. Melton Tackle July 4th Savings Event!